Spring is Here! Spring showers, seed packs, hummingbirds and more. Our design is full of colorful renditions that will remind you of spring. 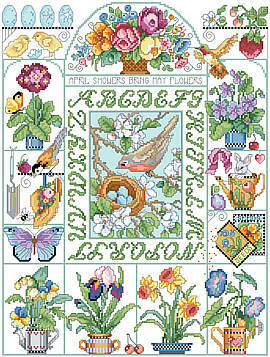 This sweet sampler is an enchanting way to celebrate the seasonal blessings of spring and summer. Inspires fond memories of sunny days and childhood play! Makes a great birthday, Mother's Day, Valentine’s Day, or ‘just because’ gift for anyone who loves springtime, flowers, and Easter. Contents: Stitch count 169w X 225h. Finished size on 14-ct fabric 12" X 16"